Ground floor apartment with 2 bedrooms and 1 bathroom for sale on the highly desirable complex of Residencial Puerto Rey in Las Marinas, Vera Playa. This urbanisation has been built to fall in love with. It is full of plants and very well maintained gardens. It has 2 large communal swimming pools, one with water at a normal temperature and the other with water that is slightly warmer. This complex is in a good location as the sea is only a 5 minute walk away and the supermarkets are only a 5 minute drive away. Opposite is a sports centre with tennis and padel courts, golf practice area, gym, childrens´ play area and a restaurant. The apartment is very well equipped with good quality materials. The terrace is covered and there is access from here to the gardens and pools. The apartment can also be accessed independently from the street. East facing. The apartment is ready to move into and would be ideal for all year round living or for holiday rentals. There is a garage also included in the price. 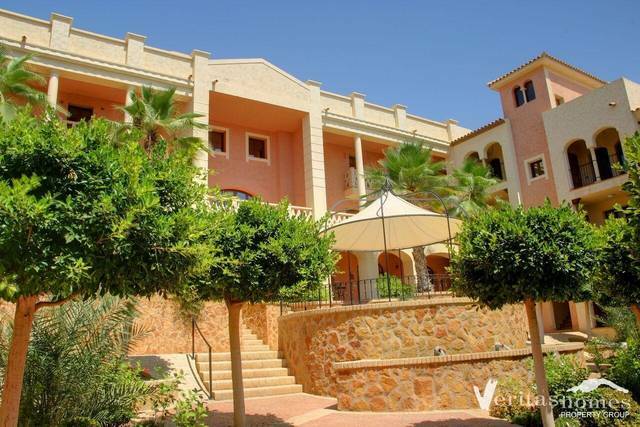 Easy access by car or local bus to neighbouring coastal towns of Mojacar, Garrucha and Vera. Close to all amenities.